Check that the wires go to the end of the plug by seeing if you can see each wire at the end, preferably see its copper reflecting (left). Then use the crimping tool (shoves the pins into the wires, and fixes the wire in the plug. 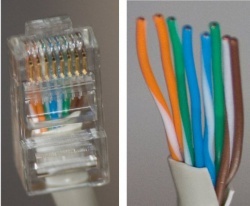 100Mbit ethernet (Fast Ethernet, FE) uses only two pairs - pins 1, 2, 3, and 6, which in the standard wiring are the orange and green wire pairs. This means you could use the other wires for different things - e.g. one link and a phone (non-conflicting if you use the stand pins for each), or some more custom combination such as two links though one wire. Gigabit ethernet uses all four pairs, so has no creative options. A crossover cable (also patch cable) has 568A on one end and 568B on the other. (crossing is also effectively done by a switch or hub, so you can use straight cables except in cases where you don’t use switches. Crossovers can be useful for direct computer-computer connections). Gigabit ethernet doesn’t need crossovers – it decided to handle that case inside the NIC and switches rather than have you do it the cable. You use straight cables everywhere (NIC-switch-NIC and NIC-NIC). Gigabit crossovers are rumored to exist (crossing blue and brown in addition to orange and green), but they are unnecessary. Loopbacks connect a port to itself. This can be used to test whether a long cable and/or its wallplug is broken, and whether a switch/router port is broken (or perhaps dirty or corroded), both just by seeing whether the link light comes on. The wiring used on 10Mbit, 100Mbit (specifically 10-BASE-T and 100-BASE-TX) ethernet over 8P8C (informally RJ45) plugs is defined by TIA/EIA-568-B, which define two plug wiring alternatives, 568A and 568B. Notice the lack of dashes; 568-B is the standard they are part of, 568-A a completely different standard (yes, that naming is stupidly confusing). This means that Americans or anyone else using 4P/6P-style phone connectors can use fully wired cables (most are fully wired - relatively few (cheaper) cables are only two-pair for only Ethernet) to wire their house/company and have the same sockets be usable to plug in phones, a computer (or both with a trivial splitter). Various companies can use use this to make their wiring simpler. GBit ethernet can use cables wired 568-style, preferably rated Cat5e, or better. Specifically, you want straight wiring and four-pair cable. Most older cables are, so can be used at gBit speeds, as 1000-BASE-T uses all four pairs instead of just two. you can mix 10/100/1000 in your network, by replacing switches (handy for partial/gradual upgrades), without having to wire about the cabling. Any cabling that is not shielded will crosstalk, meaning permissible distances are lower when many are bundled (relevant to company wiring), or be likely to get a lot of outside interference. The Shiny Special Expensive cables sold in the sort of computer shops that only sell things that come in plastic boxes are generally not necessary, particularly not on the few-meter cables for your home LAN. For example, Cat6 was made for 10gBit, most single computers don’t have a source of data to actually use that speed, and even if they had, it’s hard to get a 10gBit switch. Companies may want Cat6 (or perhaps Cat6a) for future compatibility, to be able to use gBit now and assuming that nothing replaces copper before the next update. Cat7 can go beyond 10gBit at short-ish distances, but chances are you won’t be needing that any time soon. Only data centers might care. RJ is the group of plugs that can be described by their positions and connectors, such as 8P8C in Ethernet, while RJ45 actually refers to a specific telephone wiring on the 8P-style plug (probably the most common one among several), while 8P8C refers to that plug itself and no specific wiring. Regardless, most people call the plug RJ45, regardless of wiring. Plugs may have fewer actually present conductors than they have positions, so 8P2C, 8P4C, 8P6C, 8P8C, 6P2C, 6P4C, 6P6C, 4P2C, 4P4C all exist. When there are less connectors than positions, they are in the middle positions; RJ-style wiring is from the middle out. For most of us, the is interesting only in that you can plug a phone with 6P plugs into a 8P (ethernet-plus-phone) socket and have the phone work - the clip aligns the plug in the middle. There are exceptions to the ‘always start in the middle’, but they tend to be intentionally working around RJ-style wiring. The most common use of 6P outside of the US is probably phone wiring according to RJ11, which often use just a single pair in the middle. In the US, 8P connectors with the RJ45 phone wiring is common.